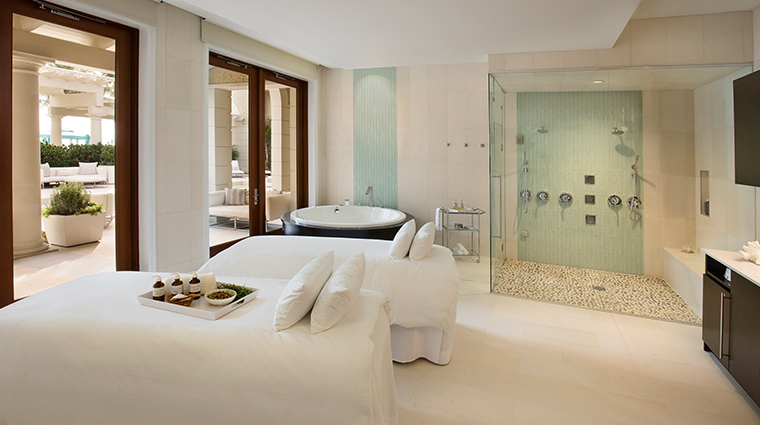 The Spa at The Breakers Palm Beach features 17 treatment rooms; eight salon stations; and a fitness center with ocean views. From marine algae body wraps to orange-blossom-sugar and salts-of-the-earth scrubs, exfoliating and cleansing never sounded so appetizing. Manicures and pedicures polish fingers and toes in regal style using all-natural products. Easy to navigate, the spa features relaxation lounges with tasty and healthful snacks, such as fresh strawberries, and herbal teas. Service within the spa is just as excellent as that inside The Breakers Palm Beach hotel; allow the staff to order lunch for you from any of the hotel restaurants and deliver it to you to enjoy in the spa, or in a secluded courtyard just outside of it. Inspired by its seaside setting yet full of modern perks (think iPad-equipped pedicure chairs), this 20,000-square-foot facility is a pampering paradise overlooking the Atlantic Ocean. 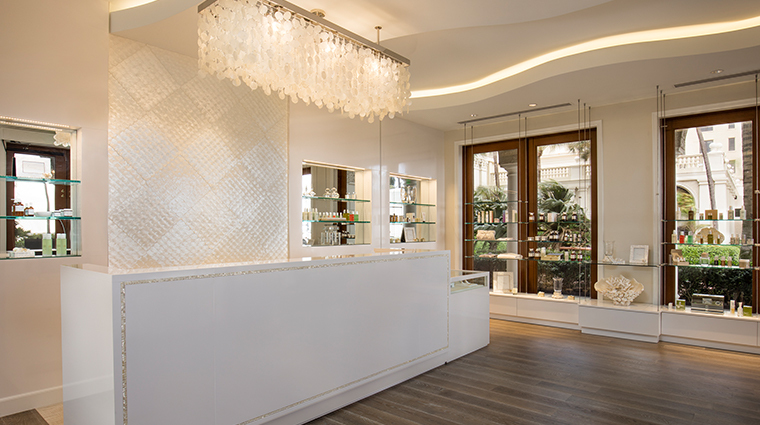 Once inside, guests come to a light wooden reception desk decorated with mosaic tiles that shine in the area’s natural light. Soft music paired with a mixture of dim and natural light creates a calming atmosphere throughout the space. 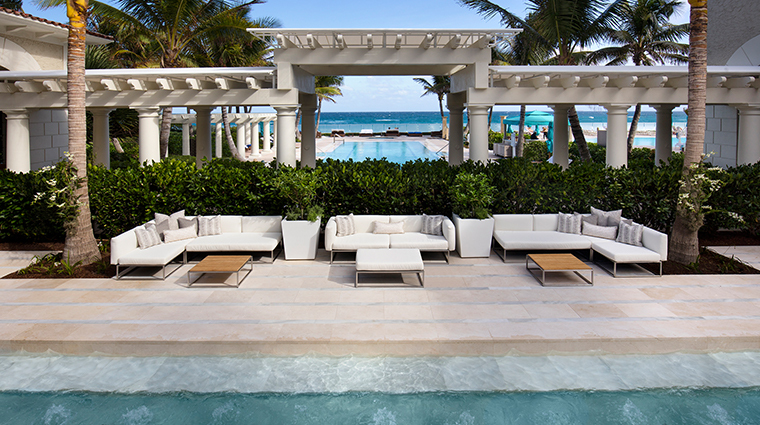 The interior design is modern, featuring clean lines and blue hues to echo the spa’s seaside location. Lounge refreshments include water infused with citrus fruit; nut and snack mixtures; hot teas; and slices of orange, pineapple and strawberries. 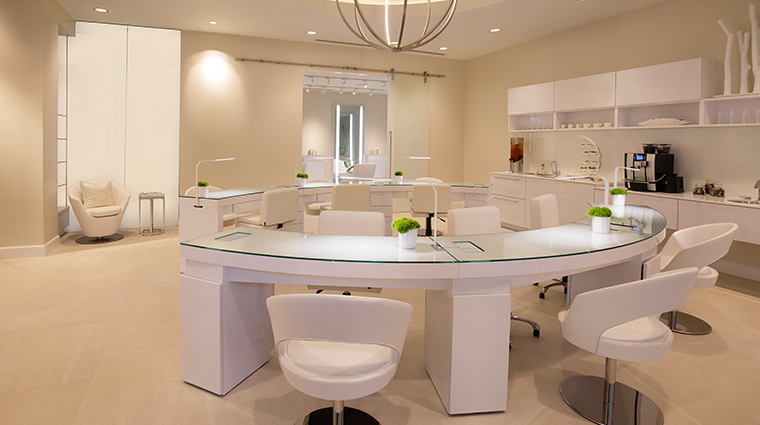 Just because you’re focusing on wellness and inner peace doesn’t mean you can’t retreat to the salon to work on your outer beauty, too, because this reknowned spa offers some stellar salon treatments. There is no sauna at the Palm Beach retreat, but spa goers can take advantage of the hotel's main pool, which is within close proximity of the elegant spa. While most of the facilities are separated by gender, it is possible to meet up with all guests in the outdoor spa courtyard in front of the spa. Before you pack up your stroller and plan on bringing your little ones with you, keep in mind that children must be at least 16 years old to use the hip spa’s oceanfront whirlpool area, lap pool or any other of the facilities and services. The personal retreat massage is a customized service that comes in 50-, 80- or 110-minute increments. Aiming to help you focus on your individualized areas of need, it can include hot stones, deep tissue work and aromatherapy. Using an array of rocking, acupressure and other types of movements, the popular Thai massage is performed (with clothing on) for 90 minutes. Exclusive to the Spa at The Breakers, the Tammy Fender Rose Quartz Massage is delivered on a therapeutic, heated bed of flowing alpha-quartz sand as the gentle vibration from rose quartz singing bowls lulls you into a deep state of relaxation. Fine lines, be gone! The Guerlain Black Orchid Treatment blends science and nature to strengthen your skin to resist and reduce wrinkles, firm texture and define facial contours. In 50 minutes, eliminate blemishes on your back caused by sunscreen, hairspray and more with the purifying back treating treatment. The men’s and women’s wet areas at this trendy hotel spa include several spacious shower stalls as well as a steam room. All are very clean and hygienic in appearance, and feature pebbled tile floors and attractive multicolored 12x24 wall tiles in blue hues. Containers of starfruit-scented shampoo, conditioner and shower gel are plentiful in the showers, where you’ll also find a folded towel, razor and shaving cream on a shelf. In the dressing areas, spray deodorant, hairspray and lotion sit in matching containers, neatly displayed in a row on vanities. There are no coed relaxation lounges or waiting areas available at the beach spa; only separate lounges for men and women. In the relaxation lounges, where guests wait for their therapists, there are reading materials from Glamour magazine to The New York Times.